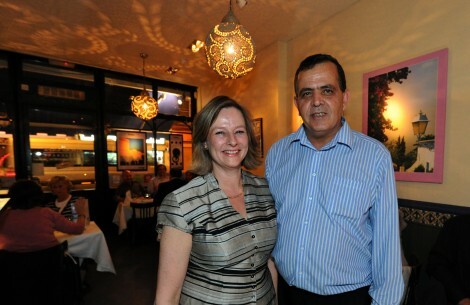 Having met in Paris and spent a number of years living in France and Tunisia, Abdel Boukraa, from the island of Djerba, southern Tunisia, and his English wife, Frances, came to London in 1989 with a plan to open the only Tunisian couscous restaurant in the capital. They recognised the potential of a long-established traditional ‘caff’, the United Café, in Shepherds Bush which was up for sale and, having renamed it after their new baby Adam, set up the beginnings of what is now a thriving family affair. “After we had been here for year we went to the bank and asked for a loan. We told the bank manager that we wanted to be a restaurant at night. Undeterred, the Boukraas went on to extend their premises, opening in the evening with a menu serving huge couscous dishes, Moroccan tagines and delicious fresh fish. The restaurant won awards and got great reviews in the Evening Standard, The Times, The Independent and many other newspapers and magazines. Abdel and Frances went on to appear on TV and radio shows. Adams Café still serves the biggest and the best breakfast on Askew Road with a loyal following of locals living and working in the area. The doors reopen at 7pm, the café having transformed into an authentic, lively Tunisian/Moroccan restaurant serving delicious, freshly prepared aromatic dishes from the Mediterranean.